The innovative drop point design and D2 tool steel combine to make the Brous Silent Soldier a formidable weapon. This innovative design is brought to life by the use of 1/4" thick D-2 tool steel. D-2 is a high-carbon high-chromium tool steel that provides very good wear resistance. D-2 has good toughness and its wear resistance is very good due to the high chromium content. This high chromium content also imparts some corrosion resistance in D-2. The Silent Soldier comes in a non-reflective, matte black guncote finish and features a V grind drop point profile. 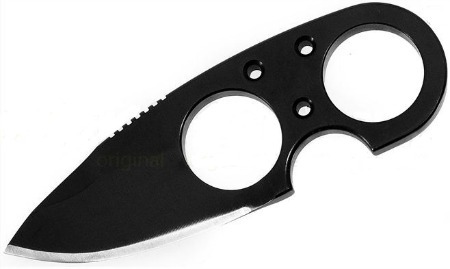 This popular blade style allows for a variety of tasks while maintaining overall strength. There is a pronounced swedge to thin out the substantial blade stock for easier penetrating cuts. This 4.50" knife has a 2" long blade with 7/8" finger holes and outstanding unique jimping. Allowing up to 6 grip options this robust, versatile and utility minded design will make the Silent Soldier V2 a formidable everyday carry tool. This efficient cutting tool comes with a neck chain and Kydex sheath with a belt clip. Grab a few of them to put in your pack, glove box, on your belt or around your neck. Affordable personal protection in a innovative design.